A Moving Postcard is a short video showing a place or an event. These are either 1-minute videos or longer versions of those videos – all shot and edited by me, Luci Westphal, a German New Yorker splitting her time between Berlin, Brooklyn and Colorado. Since May 2010 I’ve been continuously publishing a weekly 1-minute video in the categories In A Berlin Minute, In A Brooklyn Minute, In A Colorado Minute, In Another Minute or In A Minute Portrait – depending on the subject or where I live at the time. On this website, I’ve gathered all these videos to give you a searchable database to easily find what you’re looking for in Berlin, Brooklyn, Colorado or from around the world. If you enjoy watching these videos, and especially if you are posting any of my videos on your own website, please consider helping me pay for the productions and hosting by making a donation. The best way to support my work is by becoming a patron of Moving Postcard via patreon.com/LuciWest. As rewards for an ongoing monthly donation (starting as low as $1 a month), I will provide you with additional and exclusive content, the opportunity to have your say about upcoming videos and much more. The more you donate, the more you get… Win-win, right? If you prefer a onetime donation, I wholeheartedly invite you to make a PayPal Donation. Either form of financial support would make me very happy and enable me to continue creating and sharing these videos. I’m a German from outside of Hamburg. Since I was a kid I wanted to live in New York City. From 1998 til 2010s I did. I’ve always felt slightly misplaced everywhere – except for in NYC, where everyone seems to fit. I’ve been proud to tell everyone I live in Brooklyn. In April 2010, I moved to Berlin. At the time I didn’t know Berlin – I wasn’t even sure how much I knew Germany anymore. During that first week in Berlin I spontaneously (triggered by footage of the plane landing in Berlin) decided to shoot a 1-minute video every week – as a moving postcard I could share with my friends and family around the world and as a sort of weekly journal for myself. Originally titled “German New Yorker in Berlin” these videos started as just my personal random 1-minute impressions of life as a German New Yorker in Berlin – shot with just a little point’n’shoot pocket photo camera. Eventually the audience grew (to almost 8000 on YouTube alone), and I began more purposefully going on excursions specifically to shoot a video for the series. It’s been a great way to stay creative and get the almost instant gratification of sharing the creation publicly, to explore Berlin and other places, and to connect with people all around the world. Of course, Germans are considered to be very accurate, which would mean a Berlin minute by contrast to the New York minute is exactly 60 seconds… like my weekly videos. In September 2011, I returned to New York City, but decided to keep this series going. You don’t have anyone to blame but YOURSELF, dear viewer, with all of your encouragements. Because I then lived in Brooklyn, I changed the name of the series to In A Brooklyn Minute. Except that in July 2012 I returned to Berlin… and it went back to In A Berlin Minute. In the summer of 2013, I then moved to Colorado… you guessed it: as of now the weekly video is called In A Colorado Minute – or In Another Minute whenever I’m traveling – or In A Minute Portrait when the video is a 1-minute interview. But it’s always a Moving Postcard. To explain what exactly the In A Berlin Minute videos are, I started referring to them as moving postcards. Images from a place without much camera movement but with movement within the frame. Not much commentary, just the original recorded sound or a music track. As I began also publishing longer bonus versions of some of the 1-minute videos, I decided to call those videos Moving Postcards (with their own title card and all). When I launched this website, I chose the term Moving Postcard as an overall term for the short and the long videos. These videos are both a moving postcard that I made to send to you – as well as a moving postcard you can send to someone else with a special greeting. Go ahead, try it. Footage from Moving Postcard videos has also been used in another German Audi commercial, in a fictional short film, on German an Italian TV news shows, in a BBC documentary and in several music videos. After growing up near Hamburg, Germany, Luci Westphal attended film school in Florida and then spent over a decade in New York City. From 2010 until 2013, she split her time between Berlin and Brooklyn and in 2013 moved to Fort Collins, Colorado. As the co-owner of Good Hard Working People together with Scott Solary, she has produced and directed various documentaries, short films, music videos and web series. She is a Jerome Foundation Grant recipient for her documentary film All’s Well and Fair and co-directed the Jerome Foundation funded documentary All God’s Children, for which she also organized the grassroots distribution and outreach campaign. Her screenplays have won accolades at various screen-writing competitions. 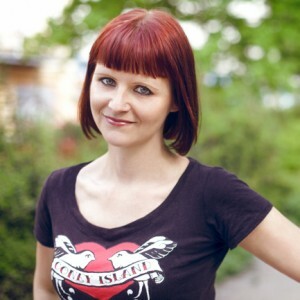 While living in Berlin, Germany, in 2010, she started a weekly 1-minute web series called Moving Postcard (aka In A Berlin Minute, In A Brooklyn Minute, In A Colorado Minute, etc.). Over the years she has directed, produced and edited commissioned documentaries, music videos, industrials and educational films. And yes, you can hire her as a director, producer, shooter or editor. You are welcome to use the videos found on this website on your own blog or other website. Please use the embed code you get from the original Vimeo or YouTube video. Downloading and re-hosting is not permitted. Please include a link back to the original post for the particular video on the Moving Postcard website. I would appreciate a mention of the Moving Postcard web series and/or my name. Furthermore, it would be great if you would send me the link of your post or website – then I can share it with my social media community. If you would like to use a video or footage in an offline project (commercial or non-commercial), please contact me. I’m sorry I’m just responding now. If you are still wanting to use the photo and haven’t yet found another one of the Rotes Rathaus, I’d definitely be interested in letting you use the photo. Can you just drop me a quick email via Hello [at] goodhardworkingpeople [dot] com so we can communicate better? Thank you.